Happy birthday to one of my favorite goodfellas, Robert De Niro, who turns 75 on August 17. Although he's best known for his gangster roles, De Niro's career has run the gamut from drama to comedy and everything in between. When you've been in over a hundred movies, there are a lot of characters to choose from. There's no way to encompass everything in one blog post, but I'm going to cover some of my favorites here. Please share yours in the comments! De Niro has worked with director Martin Scorsese 10 times! They've produced some classic cinema. But their first collaboration, Mean Streets, captures the gritty feel of 1970s New York City. Its depiction of two down-on-their-luck brothers looking to score continues to influence crime movies and television to this day. GoodFellas is one of my favorite movies of all time. Even though De Niro isn’t the star, his fascinating portrayal of Jimmy “The Gent” Conway makes him a focal point of the movie. And, like a lot of the best movie villains, this character is based on an actual person. You can read about the exploits of the real goodfellas in Wiseguy. 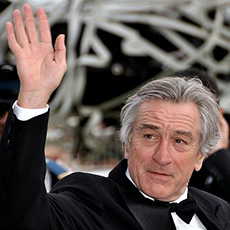 What's your favorite Robert De Niro movie?